This is a very old school dish that I turned my nose up at as a child. Now I find it is a delightful comfort food with the bonus of being Paleo (and Whole 30 approved – yay, day 2!). 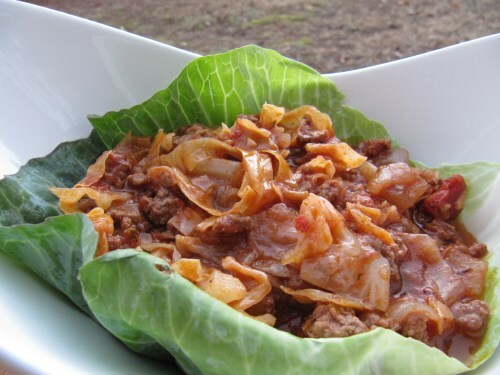 It is essentially deconstructed stuffed cabbage rolls, and requires much less effort to make (it is also fairly inexpensive to make). I made a huge batch today to eat for lunch throughout this week and am already looking forward to lunch tomorrow! In a large pot, brown meat and onions over medium heat. Add the garlic after a couple of minutes. Add cabbage and stir in tomato paste and red pepper flake. Add tomato sauce and diced tomatoes. Simmer over low heat until cabbage is tender, about 1 – 1 1/2 hours. Add oregano, thyme, and salt and pepper to taste. Enjoy! This entry was posted on Sunday, January 2nd, 2011 at 10:47 pm	and tagged with beef, cabbage, ground, paleo, primal, tomato, whole 30 and posted in Food. You can follow any responses to this entry through the RSS 2.0 feed. This looks great. Please keep posting your recipes! I can’t wait to try some of them. 3 Ingredient Sweet Potato "Pie"